At first glance they may seem like an odd couple, but their influence on the seminal events and the thinking of the 20th century is equally profound. 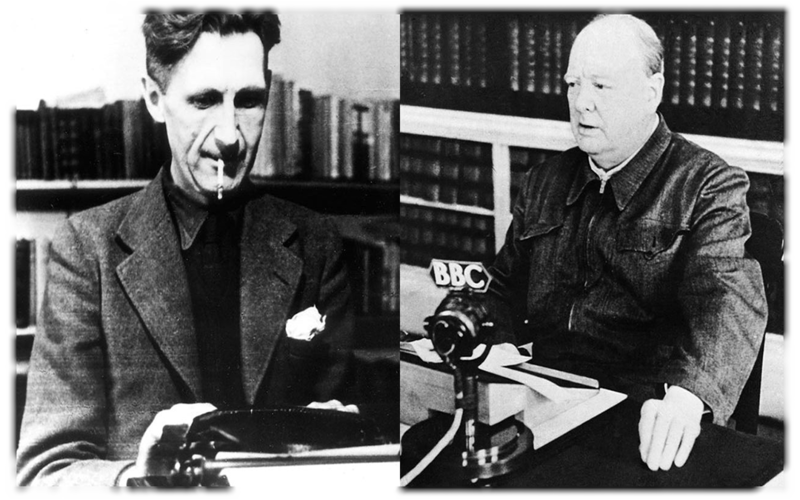 Winston Churchill defined and led the resistance against the tyranny of Adolf Hitler, George Orwell understood and explained the nature of totalitarian regimes. They were both men who were prepared to change themselves in order to change the world. Pulitzer Prize winner Thomas E. Ricks has written an insightful account of these two men whose paths never crossed and came from opposite ends of society and ideology. The book focuses on their life and deeds from the late thirties until after the Second World War. Ricks does not eulogise either man, he recognises their flaws and earlier failures, yet puts them both in the historic perspective that they deserve. Thoroughly researched and rich in meaningful anecdotes, “Churchill and Orwell: The Fight for Freedom”, is cleverly conceived and well written. With the benefit of hindsight and the emotional detachment that comes with time, it offers fresh insights on what happened during the lead-up to the war and especially those first dreadful months culminating in the Dunkirk retreat and the Battle of Britain. It is a reminder of how close Europe came to total subjugation by the Nazi juggernaut. There was not a lot in Churchill’s background that indicated he would become the formidable leader of not only of the British Empire, but the free world as we knew it. Never quite exonerated after being held responsible for the Gallipoli disaster of the First World War, he remained in the political wilderness throughout the thirties. His oratory and persistence, the latter no doubt fuelled by a desire to please his un-approving (and dead) father, kept him going, and he was reluctantly called back to the front bench as Chamberlain’s appeasement policy had proven to be the dangerous path Churchill had long warned it would be. It is important to remember that Churchill was in the minority, the British establishment, including the royal family, had all been supportive of Chamberlain. We now know the folly of it, but at the time it seemed like the right approach. Orwell (born Eric Blair, George Orwell was his pen name) was not destined for greatness, either. A mediocre journalist, essayist and occasional novelist, in 1939 his only real success had been an account of his time fighting for the communist cause during the Spanish Civil War – Homage to Catalonia – but he was no Ernest Hemingway. Like Churchill he had an inquisitive and open mind coupled with a keen understanding of human weakness and penchant for being deceived. Like Churchill, Orwell was born to British parents in India. But whereas Churchill came from peerage, Orwell’s father was a civil servant, not poor, but Orwell described his own background as ‘lower-upper-middle-class’. His life and thinking was very much defined by class struggle. Despite his disdain for people in power in general, and the British upper class in particular, he developed much respect for Churchill, the Prime Minister. Interestingly, and maybe significantly, neither man had a strong bond with his father, and both had what appears to be a strong willed and independent mother. England and her allies did, of course, win the war. But the war nevertheless marked the end of the might of the British Empire, and certainly changed the British class system forever. This is the over-riding theme in Ricks’ book, and he uses the contrasts between how the two men experienced it to great effect. George Orwell became increasingly disillusioned with how socialist ideals were usurped by communism. It is easy to forget that Josef Stalin, one of the most deviously malicious men in history, was still seen as a hero and the saviour of the ‘free’ world; And it is, of course true, that without Russia’s involvement in the war we might all be speaking German today. But it wasn’t his doing, and he used it as a pretext for killing millions of his own countrymen during and after the war. The fact that Churchill and Roosevelt had to treat him as an equal to end the war meant that winning the war was a pyrrhic victory for the Eastern European countries that ended up behind the iron curtain – a phrase coined by Churchill in a speech in 1946 – for the next 50 years. The end of the war was a bitter-sweet time for Churchill. He realised that not only was it the end of the British Empire, but it marked the beginning of America and the Soviet Union as the super-powers, and there was nothing he could do about it. To add insult to injury, the British people turfed him out at the first opportunity once the war ended. He could have been forgiven for becoming bitter and reclusive, but instead he devoted himself to write a massive six volume history of the Second World War, for which he received the Nobel Prize in Literature in 1953; “for his mastery of historical and biographical description as well as for brilliant oratory in defending exalted human values”. It was, of course, his version of events, and much more balanced and insightful accounts of the war years have been written since; But such is the benefit of hindsight, it takes time to reveal itself. Where Orwell helps us understand the threats to freedom, Churchill embodies true leadership; In the dark days of spring in 1940 he rallied a nation by telling people the truth, not what they wanted to hear. Today’s leaders have much to learn from both men. 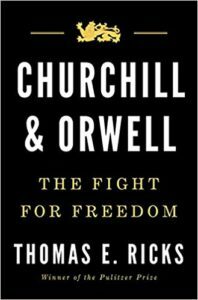 “Churchill and Orwell: The Fight for Freedom” is a terrific read. It is well structured and flows easily without boring parts, it doesn’t dwell on the melodrama as some of the current films about Churchill do, but focuses on how these two flawed individuals helped shape our world.